I had a semi crazy idea to get large culverts and bury them along the creek bank to store our kayaks in. It would be right by our floating dock so should be really easy to pull them onto the dock or back up into the culverts for storage. The culverts arrived today but I've not buried them yet. I wanted to share the idea and see if anyone else had any thoughts or tips. The large culverts are 36" interior diameter. I plan to cut them to create 3 culverts, something like 17', 15' and 8' feet matching the size of various kayaks. I also have a smaller 12" culvert to store the sailing mast of the hobie island. One question already is the Hobie Compass is being supported fully by its sides against the culvert vs. the bottom of it. You can see in the pictures below that it looks like its floating in the middle. It is still easy to pull in & out like this but do you think it would damage the kayak? I could put a piece of plywood or something else to create a floor halfway in the culvert for the compass to rest on and probably store a smaller kayak or other equipment underneath that. Here are pictures of everything so far. I collected a culvert a few years ago near the water and discovered that it was actively used by the local animals for shelter. They make an ideal den. If you bury one end, your boats may be sharing space with local critters -- something to keep in mind. I suspect your compass will eventually dent where the hull rests against the culvert. That part of the hull is not reinforced or designed to support the weight. Keep a close eye on it. Wow! Great clean up! 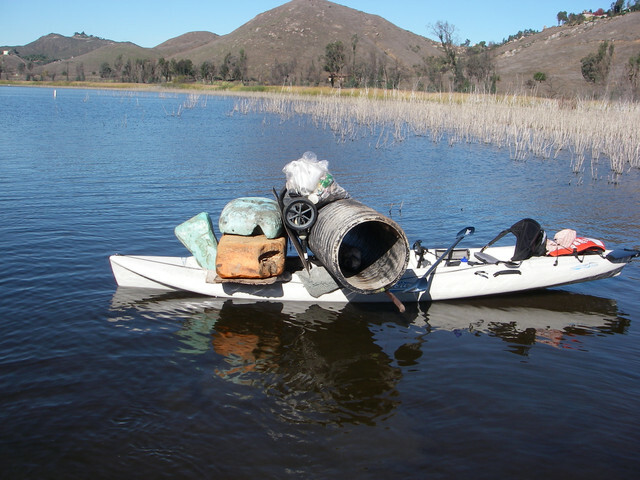 I usually end up with a few pieces of floating debris by the end of my trips but nothing like that! I've read a few warnings about critters, my initial thinking is that it would be kind of fun to see them and could show the kids. I've thought about putting a swinging fence door to cover the open end of the culverts but I'd prefer as few steps/barriers to accessing the kayaks as possible. If critters do become an annoyance then I could add that later on. I only had the compass in the culvert for a couple hours. The other kayaks I've tried so far are not as wide and sit much nicer on the bottom. Any ideas on good ways to create a floor/support for the compass? The culvert storage system is pretty much complete. I ended up keeping both at the full 20 feet length which gives me the most flexibility in what is store. Even the hobie tandem island can be completely tucked away in one. For the floor/shelves we used marine grade plywood. That will hopefully hold up fine as it gets wet occasionally. So far its been incredibly convenient and easy to pull them in & out of the tunnel. Maybe a little wire mesh to keep the critters out. One other advantage is ambient temp will be lower on hot days. And of course no UV. Great idea! But how much for those buggers? $10 at Home Depot? Ahhhh, the photos explained it. I was having a hard time imaging burying the culverts. I thought you meant in the water since you said it was next to your dock. Anyhow, thanks for the pics! If you put a bbq grate across the front (maybe on a hinge) to act as a door, you could keep critters out and be able to lock it (Theft prevention) if desired. A little bit of hardware cloth / wire mesh to the bbq grate would keep even the smallest of critters out and still allow air flow. The large culverts were about $800/each. We are still exploring ways to block off the culverts... hatch, cap, tarp (like those expandable porch systems), a fence grate or possible something else. I'm torn on the idea as I love how easy they are to use right now and don't want to add extra steps to process of using the kayaks. I do have a camera up on the dock and a sign informing people of that. I'm hoping that is enough to not have any theft issue. Wow!! $800!! And they are huge! I'm not sure I could get one home from wherever they are sold. One option to close it off could be a piece of 3/8 green treated plywood that is hinged at the bottom. When it's open it would sit flush on the deck and you'd walk on it. To close it, swing it up and hook it. Great idea and nice work. But at my place racoons and skunks would take over.